So, without further delay, we will begin introducing all FOURTEEN* teams! …….“For the Pursuit of Efficiency” is a core belief at UBC Supermilage. Their prototype efficiency is around 1000 MPG (US), while their UrbanConcept has an efficiency of around 500 MPG (US). 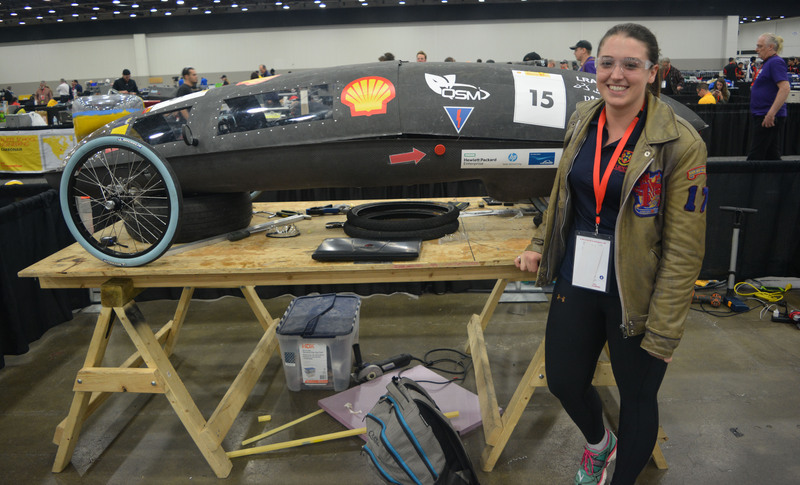 UBC’s 60 member team is broken down into four divisions: an engine division, an aeroshell division, a chassis division, and an electrical division. 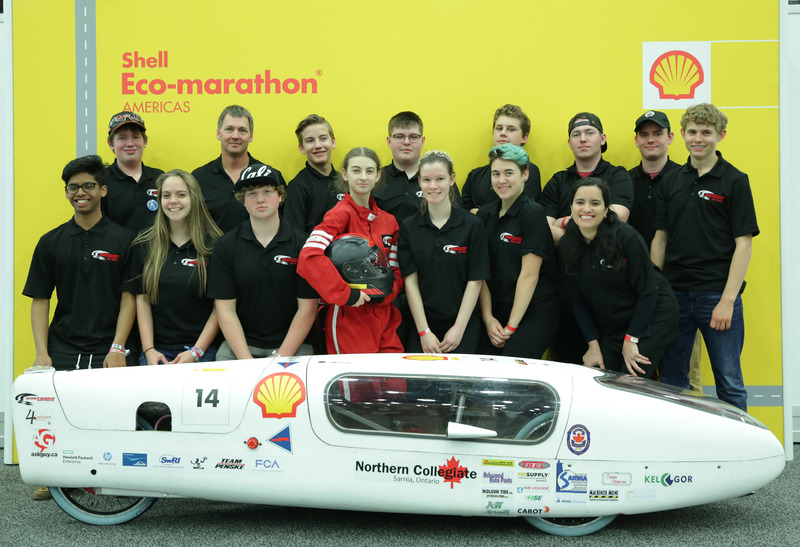 And with this team, they compete in both the Shell Eco-marathon and the SAE Supermileage Competition: busy huh? These guys are in fact so busy, we couldn’t find good time to take a photo with everyone. PS. Their YouTube channel has a sweet 4K video of their travel here, so check that out! ……. 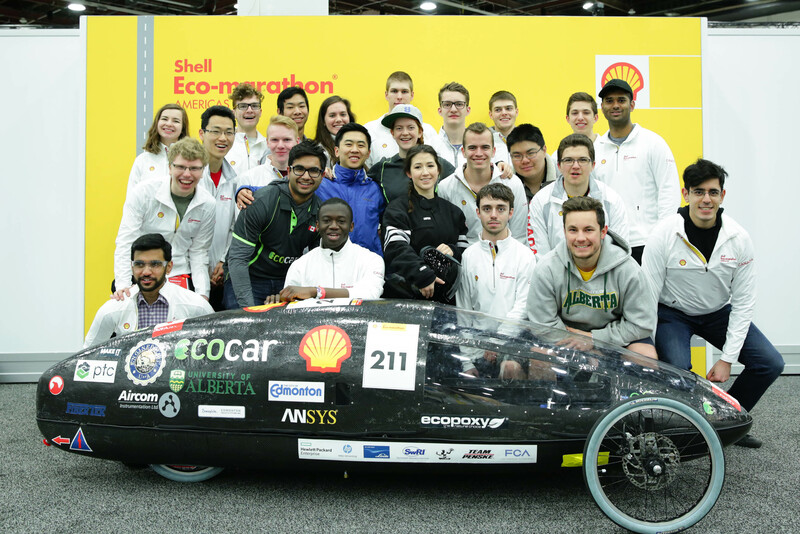 It’s us, the University of Alberta EcoCar Team! 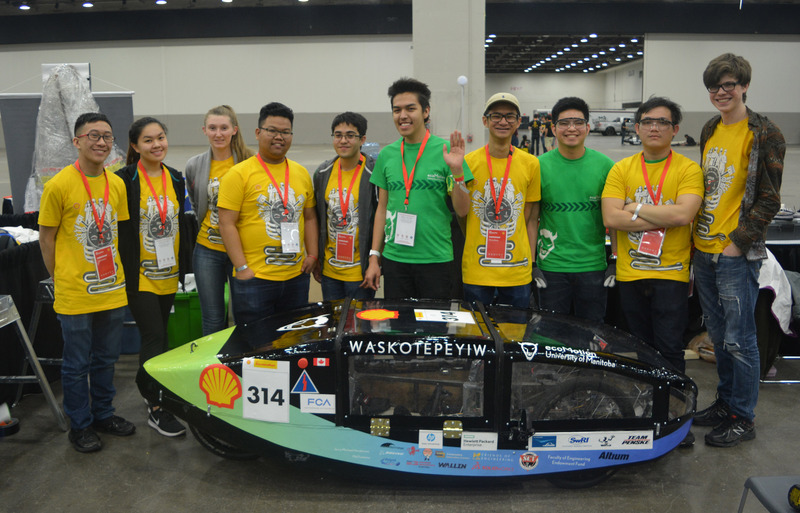 (We didn’t forget Alberta this time) This was our first year driving the vehicles down to Detroit, as well as our first year competing in the Hydrogen prototype category. If you would like to learn more about our adventures in Detroit, feel free to explore our daily competition summaries and extra content on our other social media platforms. …….SaskEco Team is relatively new, they had little experience with the SEM (this being their first competition). Their team manager mentioned that they honestly had no clue where to start, and used other teams as inspiration. They eventually came up with their vehicle after a five-month design and two-month build process. This year, they were super eager to get in a full-run on the tracks. …….UM ecoMotion main goal for this competition was to getting out on the track and pushing to get onto the leadership board. They knew they were not optimal, but they had high hopes and a great passion to do well in this competition. 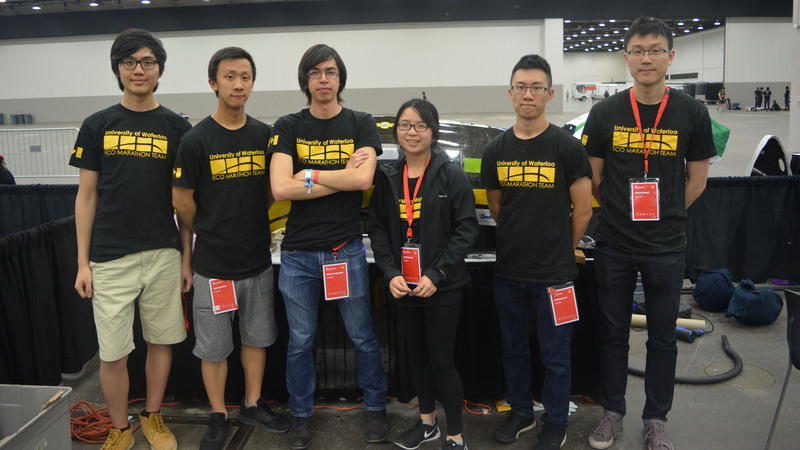 The team was also very excited, being another first-year team, to acquire and play around with CANBUS: a communication protocol used by industry. Their vehicle name, “Waskotepeyiw” means Lightning Bolt in Cree. …….A core belief at UWEMC is that “if you’re not having fun, then the rest is meaningless. Enjoy spending time to learn engineering!”. The role of team manager was handed down to Jonathan, saying he could quit if he was no longer having fun. UWEMC experimented recently with carbon fiber, and anything that can be carbon fiber, is in fact, made of carbon fiber: including the wheel mount. 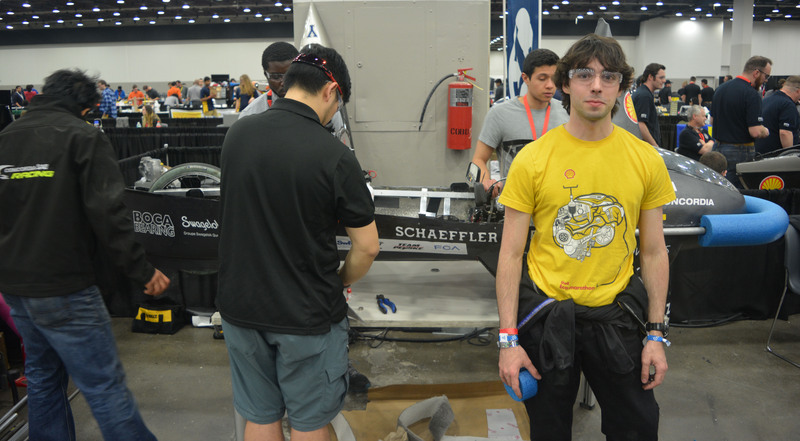 And upon working on the vehicle, they found themselves doing quite a bit of interdisciplinary learning, balancing electrical, mechanical, and chemical. …….Mohawk College will be the only team to be picture-less. They left the competition prematurely just before we could get a team photo. However, we were able to get a mini-interview in. For Mohawk Super Mileage, this is their second-year at competition, but the first year for this specific group, who picked the entire project from a former member. While they are ironing out issues from last year, all the current members joined for the love of the project, and have their hearts set on doing what they came here to do. …….U of T Supermileage traditionally had only one gasoline car which did extremely well, runner-up in their category, second only to Laval. This year, they are eager to beat Laval’s record and win first place. In addition, they have added a battery-electric vehicle to their arsenal. 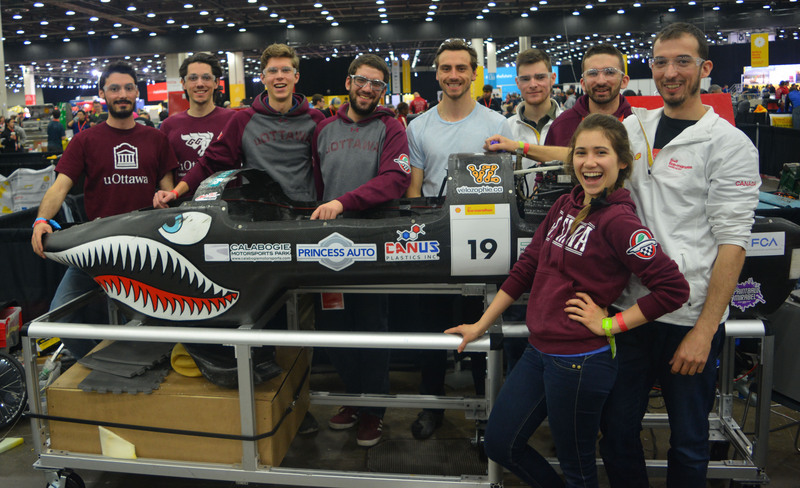 This vehicle is completely brand new, and prior to the competition, it had never raced, and the team is ecstatic to see it compete on the tracks. Finally, a team member gave us this quote: “We think of ideas, and then literally make them: imagination realized”. 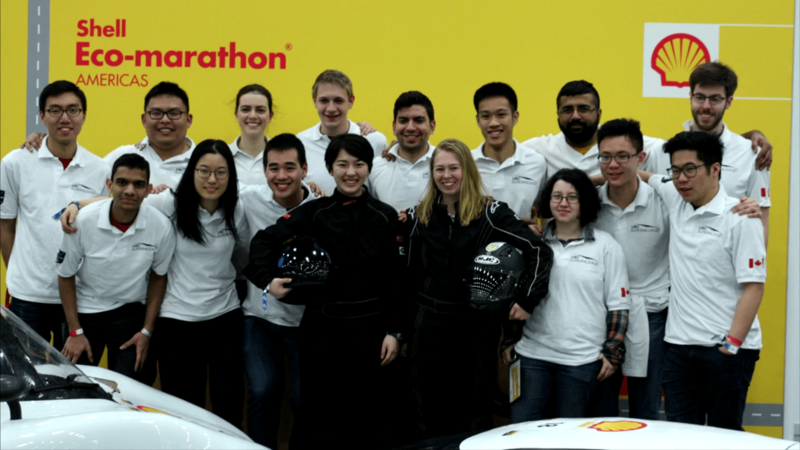 …….Along with a few other teams, Ryerson Supermileage is also a first-year team. For this competition, they were just hoping to see their vehicle run, and go with the flow afterwards. Ryerson, however, is a very innovative team. They built their vehicle without any coherent scheduling. In adddition, just like many other teams, they compete in SEM not on mandate, but out of the personal desire to learn. 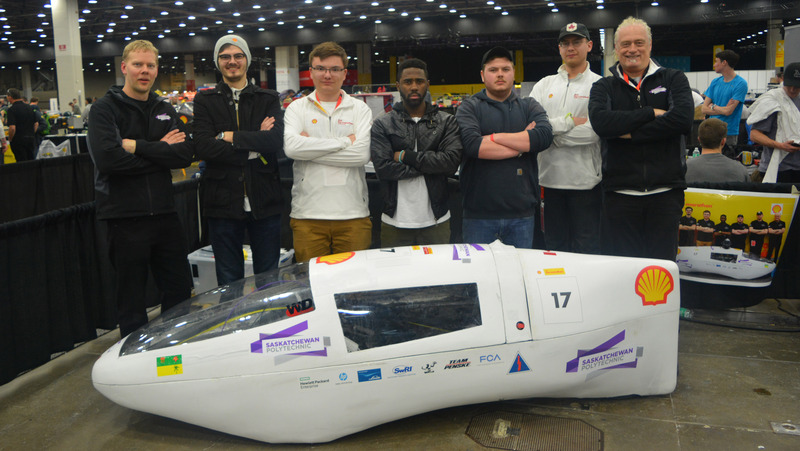 It was based on their personal willpower to conquer difficult tasks that have brought them this far, noting that despite having capstone presentations the same-day as the competion, they still made it to Detroit: talk about perseverance and will-power! …….“We’re the Fuel Efficient Sharks. FES”. One of the coolest looking vehicles in SEMA, UOttawa drives around the track in a really cool shark. And, with this shark, like U of T Supermileage, they aim to be the top. And, beat Laval. 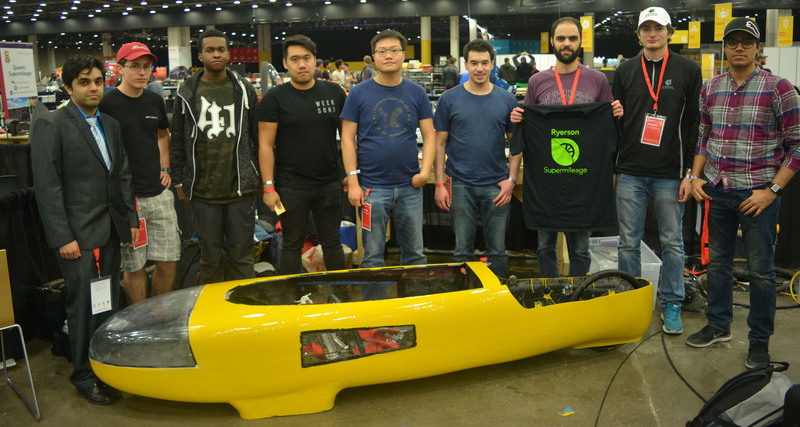 …….Concordia SAE Supermileage is another dedicated team, aiming to become more efficient with each competition. In 2016, they placed 8th in the Prototype Gasoline category. They definitely hope to improve and learn from this year’s competition. ……The Gasoline team to beat, Alérion Supermileage, or Laval, has a pretty impressive track record. They have won first-place in 2014 and 2016, and were runner-up in 2015. They were looking to beat their previous record of 1600km/L set in Marshall, Michigan in the 2016 SAE Collegiate Supermileage Competition. And this year, they walked home from Detroit, with another first place in the Gasoline Protoype category, so congratulations to them! …….“We are the Donkeys”. 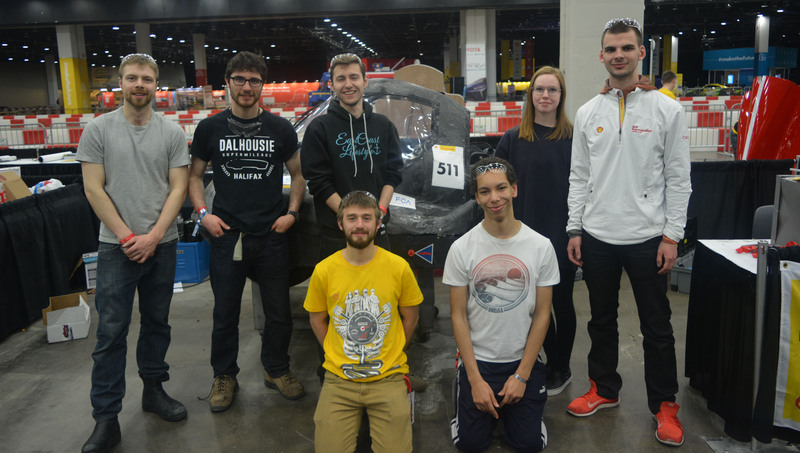 Our friends at Dalhousie went to Competition this year with their former prototype in the Gasoline category, and an new UrbanConcept in the Internal Combustion Engine (ICE) category. They were excited this year to try out different methods of construction. This team was kind enough to let us chat with them throughout competition. Feel free to hit them up at https://www.facebook.com/dalsupermileage/ and see if they’ll tell you about their crazy experiences on the track. …….Overall, we had a blast in Detroit! And we were amazed by the diversity of Canadian teams out there. We hope to see all these teams again, and even more teams from Canada. This was an incredibly long post, and we also really appreciate all our supporters. So, to everyone, have a wonderful Canada Day and a great Canada 150! Next PostNext Summer updates from the Fuel Cell team.